Are you looking for new avenues in which to share your insights on the latest legal developments in Queensland? Have you already written an article on a practice area in Queensland that you would like to see published, or do you know someone who has? Do you want to get your name, your institution’s name or your firm’s name recognised for academic and professional leadership in litigation and related disciplines in Queensland? 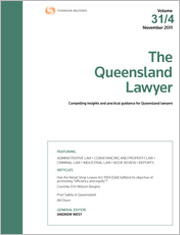 The Queensland Lawyer benefits from the oversight of Andrew West, General Editor. Andrew West is a Queensland Barrister and has been the criminal law editor of The Queensland Lawyer since 1993. This year is his 20th with The Queensland Lawyer making him the second longest serving member of the editorial team going back to the foundation of the journal’s predecessor The Queensland Justice of the Peace in 1907. Andrew has written on the subjects of carriers and police in Halsbury’s Laws of Australia, various aspects of civil procedure in The Laws of Australia and affidavits and bailment in Court Forms, Precedents and Pleadings (Qld). He has also contributed to Butterworths Australian Legal Dictionary as well as presenting occasional seminar papers. He tutors in business law at the Ipswich campus of the University of Queensland. The General Editor works with Section Editors of experienced practitioners and academics to provide extensive coverage of the major legal developments in Queensland. The General Editor is now inviting submissions for articles, letters, comments, reviews or case notes for publication in The Queensland Lawyer in 2013. The Journal welcomes submissions from judges, lawyers and academics as well as law students. There are approximately four issues published each year. The Queensland Lawyer is available in both paper and online. Online, it features links to cases, legislation and other Thomson Reuters’ publications. Moreover, access to archived volumes of the journal dating back to 1973 are now available, together with RSS feeds. The exposure potential for your original works has never been higher. Articles should not exceed 10,000 words in length and must include an abstract of 100-150 words. Short notes which illustrate practical points of interest for practitioners are also welcome. All article submissions, prior to acceptance, are subject to peer review by a suitably qualified expert. If you would like to become a contributor or if you have suggestions for the further development of The Queensland Lawyer, please email your contribution or comments to the Thomson Reuters Editor, The Queensland Lawyer, at lta.qldlawyer@thomsonreuters.com. For article submission requirements, please go to http://www.thomsonreuters.com.au/support/as_contributors.aspx.